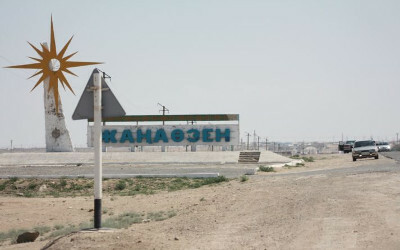 AKIPRESS.COM - Oil industry workers in Zhanaozen, in western Kazakhstan, staged a two-hour strike on July 28. According to the organizers, 700 workers took part in the strike which was sparked by the announcement that their employer, Burgylau, was planning to cut hours and this cut pay, reports The Diplomat. The brief strike apparently disbanded after the company’s head, Askhat Sariev, and several officials met with the workers. Zhanaozen was the site of a strike in 2011 that led to protests and ended in violence when security forces tried to clear protesters from the town’s square in preparation for Independence day celebrations on December 16, 2011. More than a dozen people were killed when security forces fired on the protesters and the political fallout included arrests and trials of activists and media restrictions. In a letter to Kazakh President Nursultan Nazarbayev dated July 2012, former British Prime Minister Tony Blair wrote that the deaths of 14 protesters “tragic though they were, should not obscure the enormous progress” Kazakhstan had made. At independence in 1991, Kazakhstan’s GDP rested at $24.88 billion – $1,512.49 per capita – and in the early 2000s it began to take off – rising to a high of $243.78 billion by 2013 – $14,310 per capita. Although that economic dynamism propelled the country upward, not all Kazakhs benefited to the same degree. Indeed, recent corruption scandals pulled to light – in the Panama Papers, for example – expose how well-connected Kazakhs have become tremendously wealthy and at times, exceedingly frivolous with their wealth. As Kazakhstan’s economy slows, not all Kazakhs are insulated from the harsh economic headwinds of the present. In light of the 2015 oil price crash, the sanctions-induced economic hangover wafting down from Russia, and the rapid devaluation of the Kazakh currency following its untethering last August – it’s not surprising that oil companies are trimming budgets. The first victims of such trims are often workers, who see their hours cut and pay slashed. Observers noted that the Kazakh government initially reacted to protests earlier this year in a measured fashion. While hundreds were briefly detained on May 21 as they tried to gather for nationwide protests – and some still face charges over the protests – there was no shooting. Zhanaozen was the point of reference for how Kazakhstan handed protests and anything short of violence was bound to be heralded as an improvement. Kazakhstan’s 25th independence anniversary this winter will dredge up questions of how far the country has (or has not) come since 1991. While the country’s economic growth deserves to be celebrated, Astana should not fool itself into ignoring the concerns of workers frustrated that they’re bearing the brunt of present bad economic times.